2016 was the warmest vintage on modern meteorological records in most of the southeast of Australia. If you wish to prove this look at the CliMate site, australianclimate.net.au, and choose the geographical site you wish to examine. Go to How’s the Season?, then Season’s Progress, then select the region you want to look at and finally select Data Type-Heat-Sum base 10C, Starting In-October, Lasting For-7 months. The heat summation in 2016 for Foggy Hill was an extraordinary 1439C days versus the last 13 year average of 1200.6C days. The 2016 heat summation easily eclipses the next warmest season in Foggy Hill’s brief life, 1301C days in 2013. Despite the persistent warmth, mostly caused by warm nights, there were no heat waves and the temperature only exceeded 30C 11 times and 36C twice at Foggy Hill in the 210-day growing season. The cool day maritime climate of Foggy Hill at Parawa preserved the fragile and delicate aromatic Pinot Noir varietal character. The flowering and fruit set at Foggy Hill in November 2015 was too perfect and the initial crop level was estimated at >10 tonnes/hectare. We cut off half the fruit just at veraison in late January and hand harvested 6 tonnes/hectare of lovely coloured and flavoured fruit on March the 2nd and 3rd and again on the 10th and 11th of March. The hand harvested bunches of Foggy Hill Pinot Noir were destemmed, lightly roller crushed and chilled to 2C on the way to the 0.8 tonne open fermentation tubs. There were no whole bunches incorporated into the fermentation tubs because of the high degree of maturity of the fruit from this warm vintage, requiring no added stalk tannins. A four-day cold maceration preceded the initiation of fermentation. Fermentation took 8 days of daily hand plunging and reached a peak temperature of 32C. At the completion of fermentation the tubs were sealed down for a further 8 days of maceration on skins. The tubs were pressed gently in Tapanappa’s air bag press and the wine was immediately gravitated to French oak barriques (30% new) with complete lees prior to malo-lactic fermentation. After malo-lactic fermentation was complete in the winter, the wine was clear racked and a small amount of SO2 was added. After 10 months in barrique the wine was again clear racked and was bottled in April of 2017. 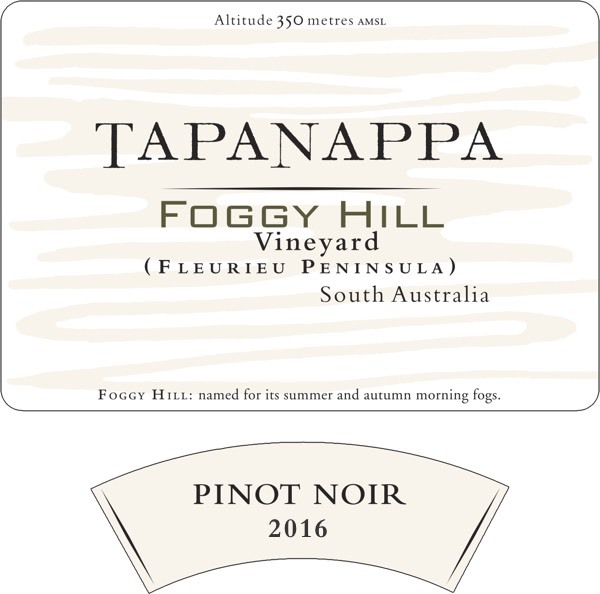 2016 Tapanappa Foggy Hill Pinot Noir is defined by the cool maritime site at Parawa and by the extraordinary warmth of the 2016 vintage. The colour is deep and the hue purple red. The wine is intense and brooding, the latent liveliness and freshness overshadowed by the ripe complex black fruit aroma and flavour of the warm ripe vintage. Bottled in April 2017. Only 2000 cases grown and made.